Just Start It it is a colorful and eye-catching WordPress Theme that is a perfect match if you’re looking for a way to start your own corporate website. This WordPress Theme is perfectly suitable with its minimal yet pretty bright design. It’s going to be easy to set up, customize, edit or have any changes you wish applied to it. Plus, all the layers are perfectly grouped, organized and named for your convenience, so be sure that converting it into your website Startup won’t be a diffucult thing to do. As to its design, the WordPress Theme will welcome your visitors with a full-width slider and scrolling down the homepage, they’ll be able to check the about info in short, your team representatives, pricing section, subscription form, testimonials and blog excerpts. Everything you need for a successful website and a highly effective web-presence is already in this pack, so be sure this is going to be one wise investment! Demo content included With one click! The theme is built with SEO best practices in mind. It uses clean, semantical and valid HTML code and CSS so search engines can index the content of your site with ease. Important content is always placed before unimportent in your source code (eg: Blog Post content before Sidebar), Headlines are wrapped in heading tags (h1, h2, h3 etc) to signalise their importance to search engines. Customize both the standard and mobile menu, create wide or normal sub-menus at the same time, choose wide menu layout with or without icons. Add widgets to one of the columns of the wide menu and create any layout you want. Create awesome one-page web sites using anchors in the menu. You can set header to be sticky and control the scroll amount (relative to the top of the page) at which the sticky header will appear. If there is a slider on the page, then the height of the slider is the default “scroll amount” for the appearance of the sticky header. Choose from our collection of fluid CSS3 animations, carefully designed for a smooth and seamless experience. The drag-and-drop Visual Composer page builder for WordPress will save you tons of time working on your site content. Now you’ll be able to create complex layouts within minutes! Add full width video backgrounds to sections and set different pattern images for each section. Contact form 7, WPML, All in One Calendar, Events manager Pro, Gravity Forms, WooCommerce, Yoast SEO, All in One Seo Pack, W3 Total Cache, WP Super Cache, JetPack, Luv Comments, Disqus, Geo Post, Ultimate Maintenance Mode, NextGEN Gallery, etc. Our theme comes with an extremely intuitive, easy-to-use admin interface. Add unlimited sliders and slides while you are editing pages/posts/portfolios, add unlimited portfolio images or videos while editing your portfolio items, add unlimited parallax sections to any page, customize typography styles, upload multiple logo versions, and much more. Take complete control over your website. Interactive Elements – Counters, pie charts, horizontal progress bars, icon progress bars, elements with animation, graph charts, and more. Blog Layouts – Choose the best look for your blog. Our Themes comes with a large collection of blog layouts, all carefully crafted and easy to add to any page. Full Screen Sections Layout – Create full screen sections with bullet naviagation and scroll through functionality. Retina Ready – Our Theme includes high resolution icons. With Themes your website will look awesome on high density Retina displays and high resolution screens. Fully Customizable Google Maps Add Google Maps to your pages and customize their style to match your website aesthetic. Add multiple addresses and custom map pins. 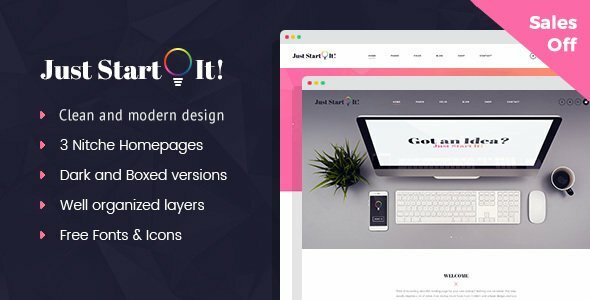 Modern, Professional Design – This theme is designed by a team of professional designers focused on user-experience and unique design style. Extremely Customizable – Unlimited colors and sizes for all elements, 600+ Google fonts, and a robust backend offer a solution for a variety of business or personal uses. Modular Shortcodes – Get creative with unlimited combinations of easy-to-use shortcodes and quickly create any type of page you like. Social – Enable social media icons and easy share functionality with the click of a button. Use the available social media icons or upload your own. Search Engine Optimized – Search engines will easily index any page of your website because of the integrated search engine support. Set meta keywords and description for each individual page and increase SEO ranking. Perfect Code – Coded in HTML5, CCS3 and jQuery, this skillfully constructed theme is 100% valid. FontAwesome is available for free on fortawesome.github.io.